The IBM Flex System™ Fabric CN4093 10Gb Converged Scalable Switch provides unmatched scalability, performance, convergence, and network virtualization, while also delivering innovations to help address a number of networking concerns today and providing capabilities that will help you prepare for the future. The switch offers full Layer 2/3 switching as well as FCoE Full Fabric and Fibre Channel NPV Gateway operations to deliver a truly converged integrated solution, and it is designed to install within the I/O module bays of the IBM Flex System Enterprise Chassis. The switch can help clients migrate to a 10 Gb or 40 Gb converged Ethernet infrastructure and offers virtualization features like Virtual Fabric and VMready®, plus the ability to work with IBM® Distributed Virtual Switch 5000V. The CN4093 offers up to 12 external programmable IBM Omni Ports, which provide extreme flexibility with the choice of SFP+ based 10 Gb Ethernet connectivity or 4/8 Gb Fibre Channel connectivity, depending on the SFP+ module used. The CN4093's flexible port licensing allows you to buy only the ports that you need, when you need them. The base switch configuration includes fourteen 10 GbE connections to the node bays, two 10 GbE SFP+ ports, and six Omni Ports with SFP+ connectors. You then have the flexibility of turning on more 10 GbE connections to the server, and more Omni Ports and 40 GbE QSFP+ uplink ports (or 4x 10 GbE SFP+ DAC uplinks on each QSFP+ port) when you need them using IBM Features on Demand licensing capabilities that provide “pay as you grow” scalability without the need for additional hardware. 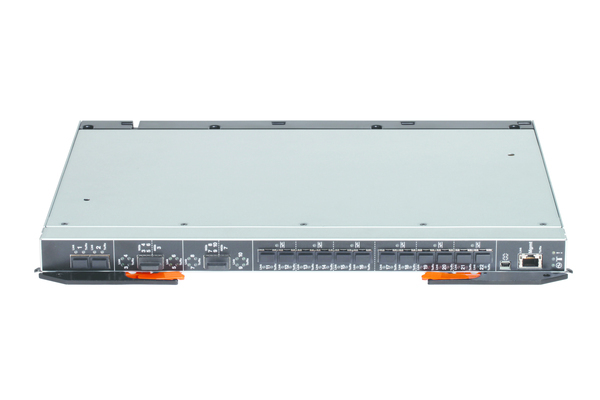 The CN4093 switch is initially licensed for fourteen 10 GbE internal ports, two external 10 GbE SFP+ ports, and six external Omni Ports enabled. Further ports can be enabled, including fourteen additional internal ports and two external 40 GbE QSFP+ uplink ports with Upgrade 1, and fourteen additional internal ports and six additional external Omni Ports with the Upgrade 2 license options. Upgrade 1 and Upgrade 2 can be applied on the switch independently from each other or in combination for full feature capability. Table 1 shows the part numbers for ordering the switches and the upgrades.